"We should never again use the expression, 'When Jesus was on earth' or think of Him as being only in heaven, Jesus is still on earth." "While all the sacraments confer grace, the Eucharist contains the author of grace, Jesus Christ Himself." - Fr. John Hardon, S.J. "My Jesus! What a lovable contrivance this holy Sacrament was - that You would hide under the appearance of bread to make Yourself loved and to be available for a visit by anyone who desires You!" "How beautiful she is, Our Lady of compassion! How dear! How utterly unselfish! How filled with joy for Him - and us - in the depths of her own agony and desolation!" "O God, O Creator, O Spirit of Life overwhelming Your creatures with ever new graces! You grant to Your chosen ones the gift which is ever renewed: the Body and Blood of Jesus Christ! "O Jesus, You instituted this Sacrament, not through any desire to draw some advantage from it for Yourself, but solely moved by love which has no other measure than to be without measure. You instituted this Sacrament because Your love exceeds all words. Burning with love for us, You desired to give Yourself to us and took up Your dwelling in the consecrated Host, entirely and forever, until the end of time. And You did this, not only to give us a memorial of Your death which is our salvation, but You did it also, to remain with us entirely and forever." "Jesus took His flesh from the flesh of Mary,"
"The bread that you see on the altar is the Body of Christ as soon as it is sanctified by God's word. The chalice, or better what is contained in the chalice, is the Blood of Christ as soon as it is sanctified by God's word,"
Of Jesus, St. Augustine says, "Look upon the beauty of your Lover." "It was love that motivated His self-emptying, that led Him to become a little lower than angels, to be subject to parents, to bow His head beneath the Baptist's hands, to endure the weakness of the flesh, and to submit to death even upon the cross,"
With Heav'nly food He feeds me. Your Cross before to guide me. From Your pure chalice flowing! 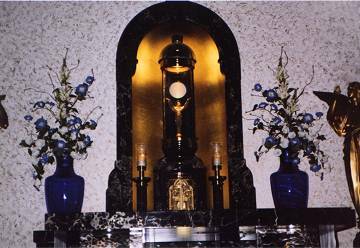 "To speak of the Blessed Sacrament is to speak of what is most sacred. How often, when we are in a state of distress, those to whom we look for help leave us; or what is worse, add to our affliction by heaping fresh troubles upon us. He is ever there waiting to help us." "We adore Thee most holy Lord Jesus Christ, here in all Thy Churches, which are in the whole world, because by Thy holy cross, Thou hast redeemed the world,"
"There is a school in Heaven, and there one has only to learn how to love. The school is in the Cenacle; the Teacher is Jesus; the matter taught is His Flesh and His Blood,"
"I love so much a soul's desire to receive Me, that I hasten to it each time it summons Me by its yearnings,"
"You Yourself, O Christ are my all. For you I keep myself chaste, and holding aloft my shining lamp I run to meet You, my Spouse,"
"In one day the Eucharist will make you produce more for the glory of God than a whole lifetime without it." "To be possessed by Jesus and to possess Him - that is the perfect reign of Love." "Moreover, on Calvary, men had become her children; she loved them with all the tenderness of a mother, and wanted their sovereign good as much as her own. That is why she was so eager to make Jesus in the Blessed Sacrament known to all, to enkindle all hearts with His love, to see them all bound and chained at His loving service, to group them into a Eucharistic Guard of Honor, a court of faithful and devoted adorers. To obtain that grace, Mary carried out a perpetual mission of prayer and of penance in the presence of the Most Holy and Adorable Eucharist, pleading for the salvation of a world redeemed by Divine Blood and, in her boundless zeal, including the needs of the faithful of every age and place who would ever share in the heritage of the Divine Eucharist,"
"Jesus has prepared not just one Host, but one for everyday of our life. The Hosts for us are ready. Let us not forfeit even one of them,"
"Love cannot triumph unless it becomes the one passion of our life. Without such passion we may produce isolated acts of love; but our life is not really won over or consecrated to an ideal. "Until we have a passionate love for our Lord in the Most Blessed Sacrament we shall accomplish nothing,"
"The devotion to the Eucharist is the most noble because it has God as its object; it is the most profitable for salvation, because It gives us the Author of Grace; it is the sweetest, because the Lord is Sweetness Itself,"
One day St. Teresa of Avila heard someone say: "If only I had lived at the time of Jesus... If only I had seen Jesus... If only I had talked with Jesus..."
To this she responded: "But do we not have in the Eucharist the living, true and real Jesus present before us? Why look for more?" "God does not despise these hidden struggles with ourselves, so much richer in merit because they are unseen: The patient man is better than the valiant and he that ruleth his spirit than he that taketh cities. (Prov. xvi. 32). By our little acts of charity practiced in the shade we convert souls far away, we help missionaries, we win for them abundant alms, and by that means build actual dwellings both spiritual and materials for our Eucharistic Lord." "To virginity is awarded the tribute of the highest beauty,"
"Were it not for the constant presence of our divine Master in our humble chapel, I would not have found it possible to persevere in sharing the lot of the lepers in Molokai...The Eucharist is the bread that gives strength... It is at once the most eloquent proof of His love and the most powerful means of fostering His love in us. He gives Himself every day so that our hearts as burning coals may set afire the hearts of the faithful,"
"I hope that this form of Adoration, with permanent exposition of the Blessed Sacrament, will continue into the future. Specifically, I hope that the fruit of this Congress results in the establishment of Perpetual Eucharistic Adoration in all parishes and Christian communities throughout the world,"
'He who eats My Flesh and drinks My Blood, abides in Me and I in him,'"
"The Power of One Hail Mary can change the world. In all our efforts and endeavors, we can never underestimate the power of prayer, and must always rely upon the help of God. In a special way we commend our efforts to the Mother of God and our own Blessed Mother." "The Rosary, especially prayed in the presence of the Blessed Sacrament, is a powerful means of spiritual grace. In all of our efforts to promote the sanctity of human life, prayer is our first and strongest resource. May we rely upon the power of our Lord's presence in the Blessed Sacrament and the intercession of His Blessed Mother to guide and help us in fostering a greater respect for human life and an end to abortion in our society..."
"Christ underwent His passion and death freely, because of the sins of men and out of infinite love, in order that all may reach salvation. It is, therefore, the burden of the Church's preaching to proclaim the Cross of Christ as the sign of God's all-embracing love and as the fountain from which every grace flows,"
"When you look at the Crucifix, you understand how much Jesus loved you then. When you look at the Sacred Host you understand how much Jesus loves you now,"
"The day's food for the day's march...that is what Holy Communion is meant to be." "As I read the sad statistics... that only 30% believe what the church teaches on the Real Presence of Christ, my mind went back to an earlier heresy - the Protestant Revolt. It was not the so called "selling of indulgences" that caused the painful break in our family. It was... [those] who no longer believed in the Real Presence..."
"When Catholics are asked, 'Do you have a personal relationship with Jesus Christ?' they should answer a resounding YES! There is no closer union with Jesus than when you receive Him in the Eucharist. You too can say with St. Paul, '...and the life I now live is not my own CHRIST IS LIVING IN ME.' (Gal 2:20)"
- Rev. Msgr. Richard L. Carroll, V.F. "We know, too, that united to the Divinity in the Eucharist there is Jesus' Body and Blood taken from the body and blood of the Blessed Virgin. Therefore at every Holy Communion we receive, it would be quite correct, and a very beautiful thing, to take notice of our Holy Mother's sweet and mysterious presence, inseparably united with Jesus in the Host. Jesus is always the Son She adores. He is Flesh of Her flesh and Blood of Her blood. If Adam could call Eve when she had been taken from his rib, 'bone of my bone and flesh of my flesh,' (Gen. 2:23), cannot the holy Virgin Mary even more rightly call Jesus 'Flesh of my flesh and Blood of my blood'? Taken from the 'intact Virgin' as says St. Thomas Aquinas, the flesh of Jesus is the maternal flesh of Mary, the blood of Jesus is the maternal blood of Mary. Therefore it will never be possible to separate Jesus from Mary." - from Jesus, Our Eucharistic Love, by Fr. Stefano Manelli, O.F.M. Conv., S.T.D. "When St. John Mary Vianney arrived at the obscure little village of Ars, someone said to him with bitterness, 'Here there is nothing to do.' 'Therefore there is everything to do,' replied the Saint. "And he began immediately to act. What did he do? He arose at 2:00am in the morning and went to pray near the altar in the dark church. He recited the Divine Office and prepared himself for Holy Mass. After the Holy Sacrifice, he made his thanksgiving; then he remained at prayer until noon. He would be always kneeling on the floor without any support, with a Rosary in his hand and his eyes fixed on the tabernacle." Recently, I heard a story about Fr. Benedict Groeschel, CFR. He was traveling with a Protestant minister in a car and when they passed a Catholic Church, Fr. Benedict made the sign of the Cross. The minister asked him why he did this. Fr. Benedict explained that it was out of reverence for Jesus in the Most Blessed Sacrament. The minister told him, if I believed what you believe, I would get out of the car, run inside the Church, fall on my knees and never get up again. In 1859, at the request of the Bishop, Bl. Eugene Mazenod, St. Peter Julian [Eymard] established Perpetual Adoration in a church entrusted to his congregation in the city of Marseilles. Shortly after returning to Paris, he wrote to the priest in charge of the Church. "Do pursue the work we have inaugurated. You know that beginnings are accompanied with more abundant grace and light. There is a greater fervor in the beginning and then enthusiasm is apt to wane. But it should be different in our case: we must keep on growing and ascending like the noonday sun, because we are always exposed to the rays of the Eucharistic Sun." "Lourdes, where non-Catholics imagine that we accord Mary undue eminence, is no doubt that place in the world where Christ in the Eucharist is most glorified. It is the only place in the world where, under the veil of the Host, Christ mingles in the midst of so many rich people and is as closely pressed by them as He was during His mortal life. His mother prays for these bodies and these souls, and Christ cures them. The procession of the Blessed Sacrament in Lourdes starts from the Grotto to show that Jesus was given to us by the Virgin. And she who stood on Golgotha, at the foot of the Cross a condemned Man, stands here by the side of the King of eternal glory." "Each time we accept to bear that cross and be nailed to it, believing against all believing - when it's impossible any longer to believe because of our pain - that's when we defeat him [satan]. "Eucharist: Sacrament to be Adored"
The letter was written on the occasion of the 750th anniversary of the first celebration of the Feast of Corpus Christi. 1. In 1246, Robert of Thourotte, your distant predecessor in the see of Liege, instituted in his Diocese the Eucharistic feast now known as Corpus Christi, at the request of Juliana of Cornillon, who had already composed an office for Corpus Christi, Eve of St. Martin and other women of Liege. A few years later in 1264, Pope Urban IV made this feast of the Body of Christ a holy day of obligation for the universal Church, thereby expressing the importance of venerating the Eucharistic Body of our Saviour. On the occasion of the 750th anniversary of the institution of this feast, as I join all the pilgrims who will be participating in the jubilee ceremonies and the faithful all over the world who ceaselessly pray before the Blessed Sacrament, I raise a fervent prayer of thanksgiving to the Lord. Jesus is no longer present to men in the same way that he was on the roads of Palestine. After the Resurrection, he appeared in his glorious body to the women and to his disciples. Then he took the Apostles and "led them out as far as Bethany, and lifting up his hands he blessed them. ...He parted from them, and was carried up into heaven" (Lk 24:50-51). But in ascending to the Father, Christ did not distance himself from men. He dwells forever in the midst of his brethren and, just as he promised, he accompanies them and guides them with his Spirit. Henceforth, his presence is of another kind. Indeed, "at the Last Supper, after celebrating the Passover with his disciples and when he was about to pass from this world to his Father, Christ instituted this sacrament as the perpetual memorial of his Passion..., the greatest of all his miracles; and he left this sacrament to those whom his absence filled with grief, as an incomparable consolation" (St. Thomas Aquinas, Office of Corpus Christi, 57, 4). Every time we celebrate the Eucharist in the Church, we recall the death of the Saviour, we proclaim his Resurrection as we await his return. Thus no sacrament is greater or more precious than that of the Eucharist; and when we receive Communion, we are incorporated into Christ. Our life is transformed and taken up by the Lord." 3. Outside the Eucharistic celebration, the Church is careful to venerate the Blessed Sacrament, which must be "reserved...as the spiritual centre of the religious and parish community" (Paul VI, Mysterium Fidei, n. 68). Contemplation prolongs Communion and enables one to meet Christ, true God and true man, in a lasting way, to let oneself be seen by him and to experience his presence. When we contemplate him present in the Blessed Sacrament of the altar, Christ draws near to us and becomes more intimate to us than we are to ourselves. He grants us a share in his divine life in a transforming union and, in the Spirit, he gives us access to the Father, as he himself said to Philip: 'He who has seen me has see the Father' (Jn 14:9). Contemplation, which is also a Communion of desire, intimately associates us with Christ, and in a very special way associates those who are prevented from receiving it. Remaining in silence before the Blessed Sacrament, it is Christ totally and really present whom we discover, whom we adore and with whom we are in contact. However, it is not through the senses that we perceive him and are close to him. Under the appearance of bread and wine, it is faith and love which lead us to recognize the Lord, he who fully communicates to us 'the blessings of Redemption which he accomplished, he, the Master, the Good Shepherd, the Mediator of most pleasing to the Father' (Leo XIII, Mirae caritatis). As the Livre de la foi of the Belgian Bishops recalls, prayer of adoration in the Presence of the Blessed Sacrament unites the faithful 'with the paschal mystery; it enables them to share in Christ's sacrifice, of which the Eucharist is the 'permanent sacrament.'" 4. In honouring the Blessed Sacrament, we also offer a profound thanksgiving to the Father, for in his Son he visited us and redeemed his people. Through the sacrifice of the Cross Jesus gave his life to the world and made us his adoptive children, in his image, establishing a particularly intimate relationship that enables us to call God by the beautiful name of Father. As Scripture reminds us, Jesus spent nights in prayer, especially at the moments when he had to make important decisions. In his prayer, by an act of filial trust and in imitation of his Lord and Master, the Christian opens his heart and his hands to receive God's gift and to thank him for his freely offered blessings. 5. It is invaluable to converse with Christ, and leaning against Jesus' breast like his beloved disciple, we can feel the infinite love of his Heart. We learn to know more deeply the One who gave Himself totally, in the different mysteries of his divine and human life, so that we may become disciples and in turn enter into this great act of giving, for the glory of God and the salvation of the world. 'Following Christ is not an outward imitation, since it touches man at the very depths of his being' (Veritatis splendor, n. 21). We are called to learn from him, gradually to be conformed to him, to let the Spirit act within us and to fulfil the mission entrusted to us. In particular, Christ's love spurs us to work constantly for the unity of his Church, to proclaim the Gospel to the ends of the earth, and to serve men, 'we who are many are one body, for we all partake of one bread' (1 Cor 10:16) such is the Good News which gladdens man's heart and shows him that he is called to take part in the blessed life with God. The Eucharistic mystery is the source, the centre and the summit of the Church's spiritual and charitable activity (cf. Presbyterorum ordinis, n. 6). Closeness to Christ in silence and contemplation does not distance us from our contemporaries but, on the contrary makes us attentive and open to human joy and distress and broadens our heart on a global scale. It unites us with our brothers and sisters in humanity and particularly with children, who are the Lord's dearly beloved. Through adoration, the Christian mysteriously contributes to the radical transformation of the world and to the sowing of the Gospel. Anyone who prays to the Saviour draws the whole world with him and raises it to God. Those who stand before the Lord are therefore fulfilling an eminent service. They are presenting to Christ all those who do not know him or are far from him; they keep watch in his presence on their behalf. 7. "When the faithful adore Christ present in the sacrament, they should remember that his presence derives from the sacrifice and is directed towards both sacramental and spiritual communion" (Sacred Congregation of Rites, Instruction on the Worship of the Eucharistic Mystery, n. 50). I therefore encourage Christians regularly to visit Christ present in the Blessed Sacrament of the altar, for we are all called to abide in the presence of God, thanks to him who is with us until the end of time. In contemplation, Christians will perceive ever more profoundly that the paschal mystery is at the heart of all Christian life. This practice leads them to join more intensely in the paschal mystery and to make the Eucharistic sacrifice, the perfect gift, the centre of their life in accordance with their specific vocation, for it "confers and incomparable dignity upon the Christian people" (Paul VI, Mysterium Fidei, n. 67); in fact, during the Eucharist, we are welcomed by Christ, we receive his forgiveness, we are nourished by his word and his bread, we are then sent out on mission in the world; thus each one is called to witness to what he has received and to do the same for his brethren. The faithful strengthen their hope by discovering that with Christ suffering and distress can be transfigured, for with him we have already returned from death to life. As a result, when they offer the Lord of history their own life, their work and all creation, their days are illumined by him. 8. I urge priests, religious and lay people to continue and redouble their efforts to teach the younger generations the meaning and value of Eucharistic adoration and devotion. How will young people be able to know the Lord if they are not introduced to the mystery of his presence? Like the young Samuel, by learning the words of the prayer of the heart, they will be closer to the Lord who will accompany them in their spiritual and human growth, and in the missionary witness which they must give throughout their life. The Eucharistic mystery is in fact the "summit of evangelization" (Lumen gentium, n. 28), for it is the most eminent testimony to Christ's Resurrection. All interior life needs silence and intimacy with Christ in order to develop. This gradual familiarity with the Lord will enable certain young people to be involved in serving as acolytes and to taking a more active part in Mass; for young boys, to be near the altar is also a privileged opportunity to hear Christ's call to follow him more radically in the priestly ministry. From the Vatican, 28 May 1996. "On her return to Lisieux [from her pilgrimage to Rome to see the Pope regarding her entrance to the Carmel], she sent her gold bracelet to the chaplains of Montmarte so it could be melted into part of a great monstrance - a gesture that clearly expressed Therese's desire to keep watch day and night close to Jesus in the Eucharist." Note: The monstrance containing the gold of Therese's bracelet is at Le Sacre Coeur in Paris, France where Jesus in the Most Blessed Sacrament is perpetually adored to this day. "My mission (is) to make God loved...," - St. Therese of Lisieux. "One Sunday in July 1887, Therese received a great Eucharistic grace at Saint-Pierre cathedral. At the end of the Mass, a picture of the Crucified Christ stuck out of her missal. She was struck by the idea that His Blood was falling to the ground without anyone thinking of collecting it. She decided to remain at the foot of the cross for the rest of her life to receive this precious Divine dew for the sake of sinners. In her heart sounded the cry of Jesus, I thirst. It was her thirst for love,"
"The message of all the Marian apparitions, both past and present, is that the triumph of the Immaculate Heart of Mary will culminate in the Eucharistic reign of the Sacred Heart of Jesus. This Eucharistic reign will come through perpetual adoration of Jesus in the Blessed Sacrament,"
"After Communion, he felt the Presence inside himself as a radiant fire of such exceeding sweetness that all sense of time and every sensation of anxiety disappeared... Eventually all articulate words subsided into a current of communication flowing like a river of love between Lord and servant, between Creator and creature, between Friend and friend, Lover and lover. The union was so utterly complete that the old priest sat immobile in perfect recollection for a time that existed beyond time,"
"We need... not just devotion to the Eucharist, but profound union with Him in the Eucharist,"